Garden of Aaron: Travel Report - Berlin Mystery Shrub?! Travel Report - Berlin Mystery Shrub?! Unknown mystery shrub in a planter box on Berlin street. Can anyone ID it? Well, they say travel broadens the mind. But sometimes it just mystifies the mind. 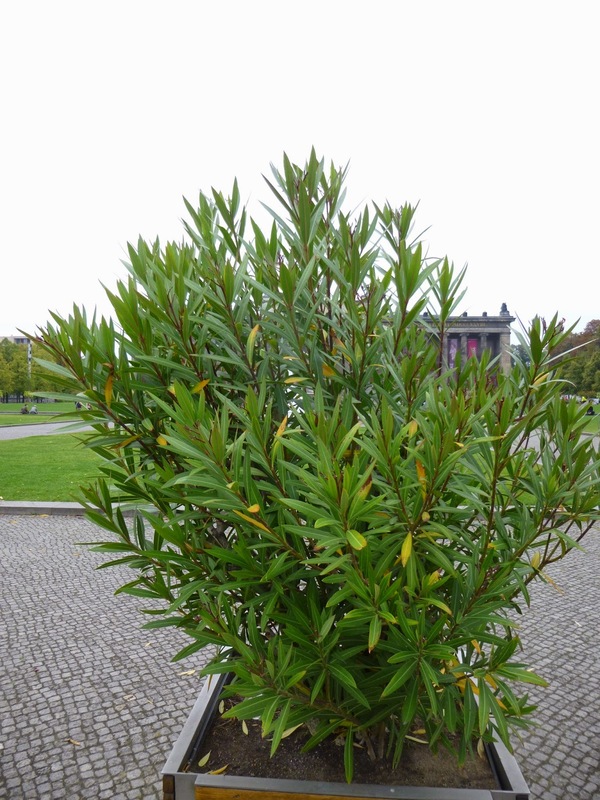 At least that was the case when I came upon this landscaping shrub on the Berlin streetscape - in a prominent spot on Museum Island to be precise. Anyone have a clue as to the identity of this mysterious (to me) shrub? Close up on Berlin mystery shrub flower. Does this help any plant sleuths out there? Detail of mystery shrub seedpod. Surely this must jog somebody's memory? Update 10/28/14 - After cross-posting my "Please help with plant ID!" request to Google+, I received help from a few friends over there ( +Eric Hunt, +Tatjana Tijan and +Teresa Schoellkopf) letting me know that this is most likely Oleander -- or more scientifically, Nerium oleander, as Lynn points out in the comments below. 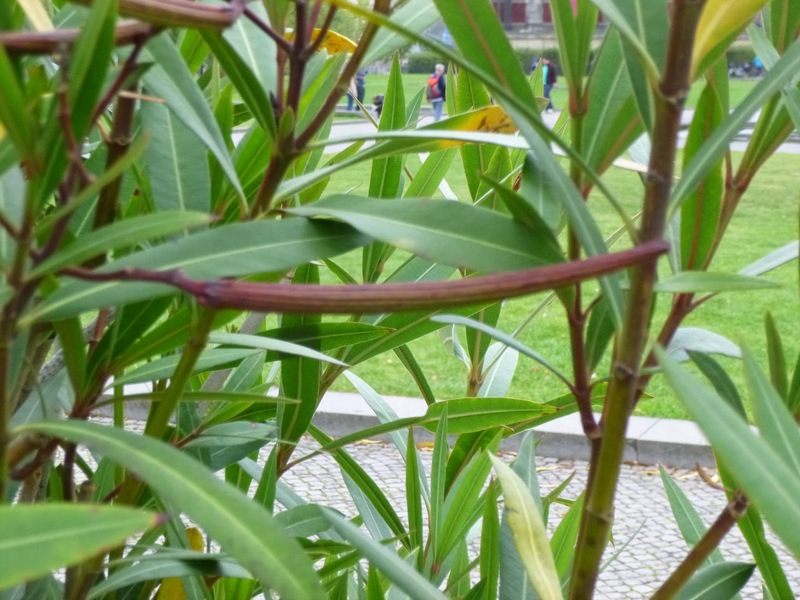 As I wrote to Eric, I was kind of amazed that Berlin is using the shrub for street landscaping, considering its poisonous reputation, but Eric told me that in fact oleander is used heavily in California as a landscaping shrub, and Tatjana chimed in to say that it also grows in profusion around the Medtierranean. 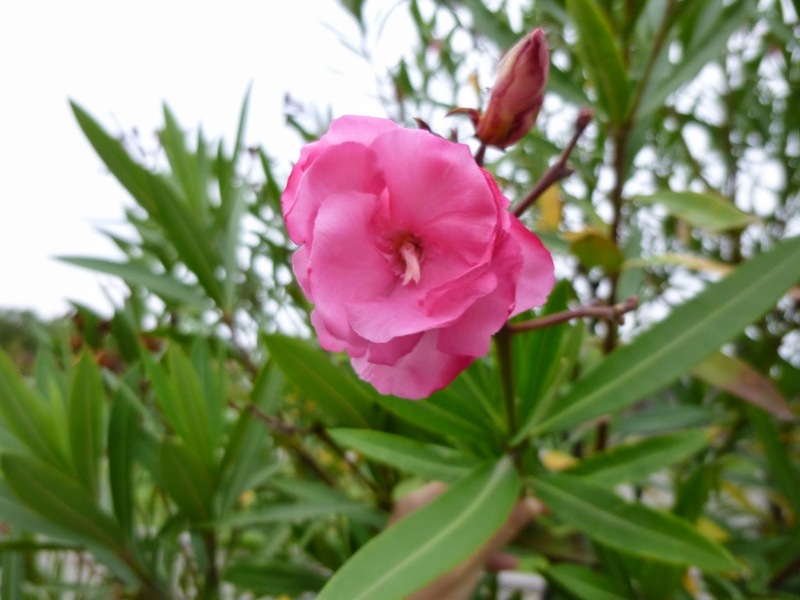 Teresa then mentioned another potential drawback with oleander, saying that her experience with the shrub in Galveston, TX leads her to believe that it has an aggressive root system capable of breaking through PVC pipe and damaging sewer lines. Yikes. Do you think folks should still be planting oleander given these drawbacks and the fact that it seems to have few ecological benefits? First Taste - Sweet Potato Greens!